The sculptor Hubert Privé, well known for his works in golf courses in Florida, Dubai, Mauritius and with a numerous and large collection of works in golf courses all around the world, has inaugurated the 10th January 2019, a great sculpture created for Golf Costa Adeje and that, according to the sculptor's own words "is a very important work for the development and promotion of my work in Spain". Very well known is his works, placed in a roundabout in Verneuil-sur-Avre, just in front of the Saint-Quentin-en-Yvelines Golf Course that the sculptor created with the colors of Europe and the United States for the Ryder Cup 2018 held in France last September. 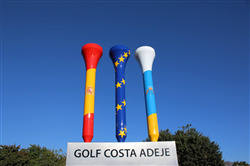 Golf Costa Adeje wanted that, the colours of its sculpture represented the Canary Islands, in honor of the beautiful islands and wonderful land, Spain its country and Europe as proof of respect and gratitude to all golfers from the old continent that visit Golf Costa Adeje every year.